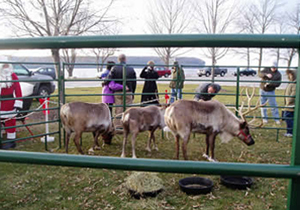 Visit Santa and his helpers at the live reindeer display, enjoy children's activities and crafts, holiday open houses, wagon rides, soup, and the Christmas tree lighting ceremony. DETAILS! Visit Santa’s little helpers at the live reindeer display. Children’s activities and crafts in the Village Hall, holiday open houses and a Christmas Tree Lighting Ceremony at Harborside Park. 920-854-4989. DETAILS!